Billy Ray Copeland, better known as Bill or Alabama, passed away Monday, March 25, 2019 at Belmar Oakland in Troy. He was born June 9, 1930 in Blount County, Alabama to Eugene and Gladys Copeland. A longtime resident of Berkley, Bill proudly served our country in the US Navy during the Korean Conflict. He was awarded the National Defense Service Ribbon, United Nations Service Ribbon, and Korean Service Ribbon during his time in the military. 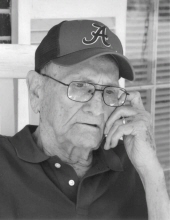 He loved watching sports especially his Detroit Tigers, Detroit Lions, and Alabama Crimson Tide. He also enjoyed hunting and was an avid bowler. Bill retired from the Birmingham Post Office. He was a loving husband, caring father, doting grandfather, and proud great grandfather who will be greatly missed. He is survived by his children, Ronda Copeland and Michael Copeland; siblings, Patsy Hallmark and Arvil (Peggy) Copeland; grandchildren, Josh, Laura, Jeremy, Katy, and Evan; and great grandchildren, Jack, Maddie, and Lily. Preceding him in death are his of 58 years, Virginia (2014), whom he married January 21, 1956 in Mississippi; his parents; son, Jeff Copeland; siblings, Margaret, Wendell, Deerman, and Marvin; and brother-in-law, Bob Hallmark. Memorial contributions may be made to the Alzheimer’s Association of Michigan. To send flowers or a remembrance gift to the family of Bill R Copeland, please visit our Tribute Store. "Email Address" would like to share the life celebration of Bill R Copeland. Click on the "link" to go to share a favorite memory or leave a condolence message for the family.